D Scale is a safe, effective way to remove lime scale and rust deposits and to clean the interior surfaces of water heaters. It is non-corrosive and can be safely used on Stainless Steel, Copper, Brass, Plastics and leaves no odour. Periodic us of D Scale in the water heater will avoid mineral deposits building up, so improving the efficiency and extending the life of the equipment. 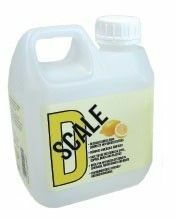 D Scale contains citric acid which is a naturally occurring organic fruit acid especially found in fruits such as lemons and oranges. Calcium carbonate scale builds up layers and hard gritty deposits on the interior surfaces of a water heater. When left without treatment, lime deposits build up and will clog the interior pipes within the water heater, restricting flow and reducing operating efficiency.